We will teach Mathematics with Classical books from French Mathematicians like Cauchy and Galois, Disquisitiones Arithmeticae by Karl Friedrich Gauss and others. Of course we will cover that it is called "updated or latest" material, but for me science need a reformulation based on facts and to help people. 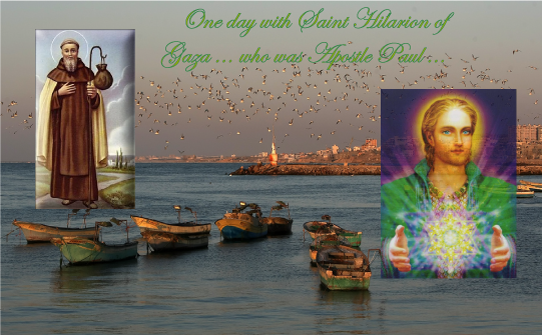 In Piscean Age of Master Jesus ... ended in 1969 with Moon Walking ... the Master of Healing ... was him, Saint Paul, or Apostle Paul who returned in 291 ... born in Gaza, and lived in Sicily ... always in the Mediterranean Area, like Saint Hilarion. Now ... when Master Jesus die ... People cry ... but him leave his state of "invisibility" and because their disciples were 'clear' (L. Ron Hubbard term) ... or 'balanced' (Peggy Dubro Term) ... they saw him ... both male and female ... and he say "I AM here", and they first his Wife, Mary of Magdalene ... got comfort, as well his Mother Mary ... and then he appear on his Apostles. Now ... Peter (El Moria) ... the Holder of the Torch of the first Church, and Paul his second ... both in Rome were Great. Apostle Paul wrote the Corinthians with the help of candle ... nothing else. No Computers, no iPad ... nothing else. Aurelia Louise Jones who worked for the Community of Telos ... in Shasta (and not so far we will see them) ... They do not need to arrive from Space ... or from High Dimensions ... they live in High Dimensions ... here on Earth ... but there are no sense they become full visible ... In fact, the World is unable to see them ... because the World is ... "un-balanced" ... and "not clear" ... When the world will be enough "clean" ... we will see them ... and will be a great day. You can read about Apostle Paul in the Aurelia Book ... "The Seven Sacred Flames". Lord Maitreya now rule on Wednesday ... his color is Silver ... but also Blue and Yellow and he propose the Divine Logic. Today, El Moria rules the Flame of Healing and now this flame is Yellow ... not Green anymore. With the arrival of Aquarian Age ... the meaning of the Flames ... and its colors ... changes. Let me propose 4 Books ... or pamphlets ... from Elizabeth Clare ... about Africa, Chakras, Hilarion and Abundance. When a person ... may be a Spiritual Seeker (an Apostle like Peter, or John, or Paul) do not complete his mission ... by covenant (personal agreement with Heaven's Lords) ... or insufficient Light ... enough Karma ... necessarily return to born. In fact, Peter (El Moria) was first Abraham ... and in his last Incarnations ... King Arthur ... in the days of Theosophy he become visible to Madam Blavatsky ... with Koot Hoomi (Saint Francis) and Djwal Kul (King Magi Balthazar with Melchior (Moria) and Gaspar (Koot hoomi). If you accept a Sacred Knight of Faith return to consolidate his Mandate ... like Saint Hilarion ... Some never leave like Saint Germain that was Joseph with Mary in Israel and Saint Alban in England and King Solomon in Israel ... Well ... you are missing the Salt in the Soup of Belief. My idea here is to talk about ... "Spiritual Healing" ... not only ... "Physical Healing" ... and like Time and Space ... one depends of the other. Physical Healing depends of Spiritual Healing and ... Faith (A Female Archangel) is not enough ... while absolutely necessary. The Lesson of Healing. There are Temples and each temple have a Master or Chohan. There are many, not Seven. Lord Meru, or Maestro Mer design ... "The Brotherhood of Seven Colors" ... must join ... and this is a Heavenly Brotherhood connected to the Great White Brotherhood. It is related to South America (not Central or North) ... and specifically The Lake of Titicaca. Blue - Will of God ... ruled by Archangels Michael and Gabriel on Thor-day, Thursday. Pink - Love of God ... ruled by Koot Hoomi ... on Mars-day, Tuesday. Yellow - Healing of God ... ruled by El Moria on Sun-day. White - Purity and Ascension ... ruled by Jesus, The Christ in Person ... on Moon-days. Silver - Divine Logic of the Mind of God ... ruled by Lord Maitreya who was the Buddha, and Krishna on Wednesday. Cyan or Celeste - Compassion and Healing of the Heart with Wisdom ... ruled by Mother Mary on Saturn-day or Sabbath. Orange - Love in Family ... Understanding ... ruled by Kuan Yin, the Goodess of Mercy on Venus-day, Frid-day. Old Officers ... like Serapis Bay (before ruled Ascension on Friday), or Confucius ... ruling now the Flame of Wisdom on Students and Universities, take the place of Lanto who ruled the Yellow Flame of Wisdom before ... all them are still them. You can talk with Hilarion (who was Apostle Paul) on Wednesday ... Mercury day ... that day is the day of Alchemy ... that pretend to establish ... Heaven on Earth.